The sparkling series featured the irresistible William Powell and Myrna Loy chemistry as husband and wife sleuths who solved murders with the aid of their wire-haired terrier, Asta. Set in the glamorous world of 1930s upper-class Manhattan, The Thin Man and its sequels established the standard for witty comedy, clever dialogue and urbane one upmanship. 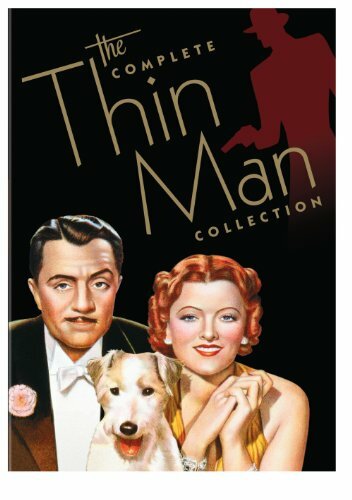 The 7-Disc set includes THE THIN MAN, AFTER THE THIN MAN, ANOTHER THIN MAN, SHADOW OF THE THIN MAN, SONG OF THE THIN MAN, THE THIN MAN GOES HOME, and the ALIAS NICK & NORA bonus documentary disc. If you have any questions about this product by WarnerBrothers, contact us by completing and submitting the form below. If you are looking for a specif part number, please include it with your message.